Koenig FrameWorks is hosting its annual holiday small works show "Small Works: Affordable Art for Small Spaces", with over 140 pieces of framed, ready-to-hang original art made by local artists, each priced under $100. The exhibit and sale runs from Friday, December 2, to Saturday, December 24, 2011. The opening reception is Friday, December 2, from 6 pm - 9 pm. Koenig FrameWorks is located at 97 South Main St., Newtown, CT. The night coincides with Newtown's Ram Pasture holiday tree lighting. If you've never seen it, it is particularly beautiful, because the historic homes on Main Street put luminaria on their front lawns lighting the way to the tree. The tree lighting festivities start at 6:30 and the tree is illuminated at 7 pm. Then you can head on over to FrameWorks. 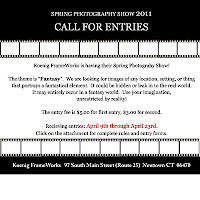 Koenig FrameWorks in Newtown is hosting a juried spring photography show on the theme of "Fantasy." 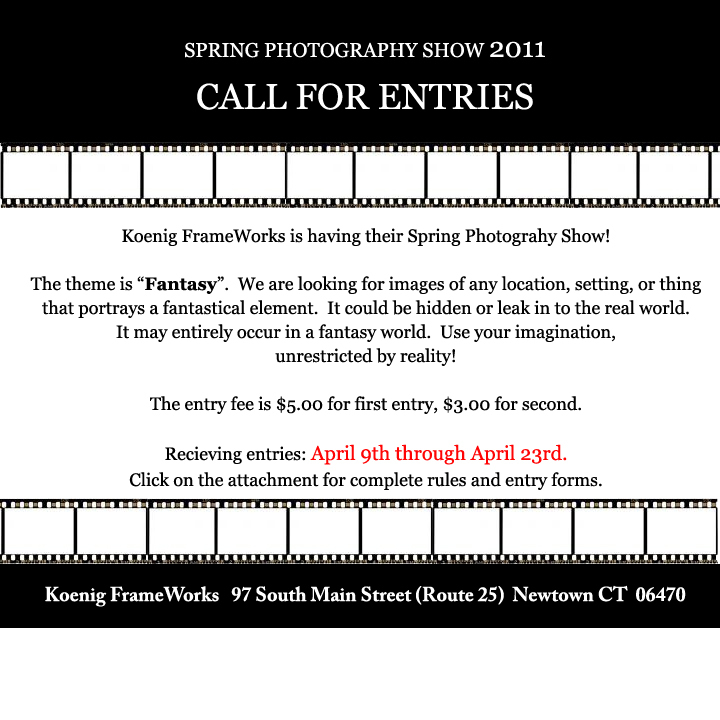 They are receiving submissions between April 9th and April 23, 2011. The exhibit will run from May 6-May 27, 2011. They define fantasy as "a supposition based on no solid foundation; visionary idea; illusion; something that people believe is false." They are encouraging photographers to enter "images of any location, setting, or thing that portrays a fantastical element. It could be hidden, or leak into the real world. It may entirely occur in a fantasy world." The opening reception and awarding of ribbons will be on May 6th. Koenig FrameWorks is located at 97 South Main St. (Rt. 25) Newtown, CT.